Product Description: Natural twine grip tightly, Easy to use ,String diameter φ:3 mm. 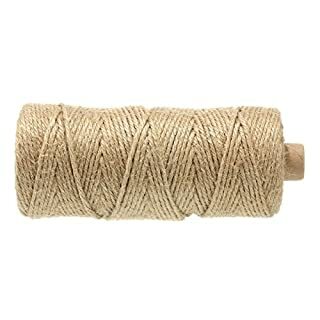 Natural twine grip tightly ,Easy to use.Good helper in life.Perfect thickness,light weight.Best use in Arts and Crafts wrapping gifts. Packed on a coil and it is very convenient and handy to use. 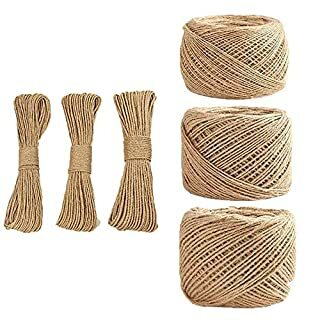 You can cut freely according to the length you want.Use the jute twine to wrap around glasses and favors for a wedding party favor ,decorate wine bottles. 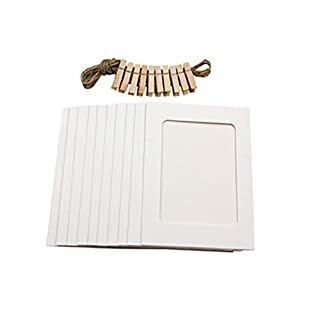 Specification: Material:100% Natural Jute Thickness:3mm/6Ply Size:7*10cm/2.75*3.93inch Length:91.4m/100 yard Weight:193g Package Include:1*Jute Rope Roll Usage: 1.Hang gift tags. 2.Wrap on gift box, present . 3.An accent on some crafts. 4.Perfect for Photo Display, crafting tool. 5.Great to decorate wine bottles, glasses etc. Ships from Hong Kong. 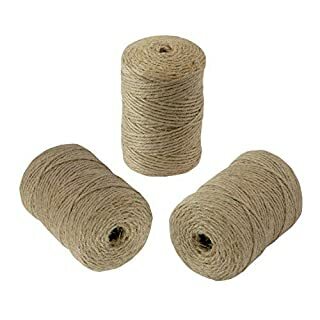 These natural jute twine can be used in many occasions like gardening and recycling, and DIY packing, room decoration, binding and so on. Perfect for the packing material of the following festive like Thanksgiving Day, Christmas and more. Please kindly note that one quantity stands for one unit of length. 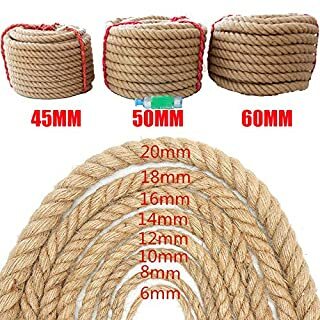 When you order more than 1 quantity, the rope will not be cut apart, will send you a whole rope of the correct length for your convenience use. Purchase Notes:Due to different measurement methods, there may be an error of 1-2cm, please refer to the actual product.Delivery time is 10-20 working days, if you do not receive the order within 30 days, please contact us!If you have any questions, please contact customer service in time. 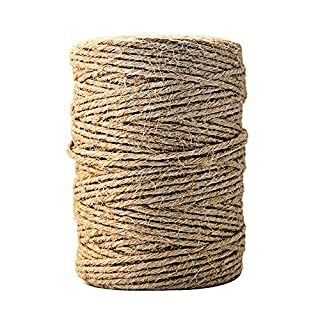 If you are satisfied with our products and services, please give praise and support, thank you.100% Natural Hemp Rope,soft and durable,flexible,Diameter:3mm to 60mm, length:10metersOur store has many styles, you can go to the store to browse, welcome to our store!Product Name: hemp ropeMaterial: hempProducts include: RopeScope of application: Furniture decoration, Fire escape, emergency rescue, mountain climbing, rock climbing and other protection.Precautions1. 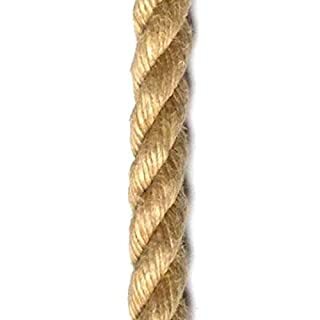 Although the climbing ropes sold on the market have been processed, if the rope is cut to a suitable length in meters, the end of the rope must be fixed. If you ignore this, the end of the rope may spread out during use and cause danger.2. Do not soil or step on the rope as this may cause the strength of the rope to deteriorate. Therefore, wipe off the dirt after use.3. Do not wet the rope, the wet rope may become heavy and smooth, which is difficult to use.4. Understand the safety of the rope.5. Avoid touching the rope with sharp objects. If necessary, cover the towel to protect the rope.6. Don't lend the rope to others: It is dangerous to use a broken rope, but you don't know.7 ropes can be said to be consumables. Check and replace the new rope immediately after the scar is found. 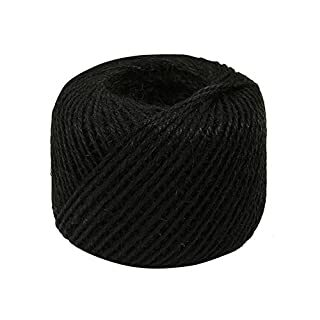 In addition to the need to replace the rope with scratches, cuts or scratches, the rope needs to be replaced for more than two years, even if there are no obvious scars. In addition, sudden weight ropes are no longer available. Cikuso is a brand which was registered. We are under Cikuso authorization to market the products under Cikuso trademark. We adhere to providing high-quality products and high-standard customer service all the time. 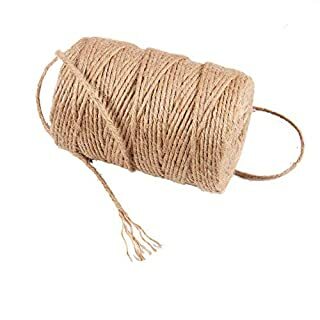 10m Natural Hemp cord Jute cord Sisal rope 3mm cord sackThickness: about 3 mm/0.12 inchesLength: Approx 10 m/10.94 metersPackage contains:1 x 10M jute cord ropeNote: Light shooting and different displays may cause the color of the item in the picture a little different from the real thing. The measurement allowed error is +/- 1-3cm. 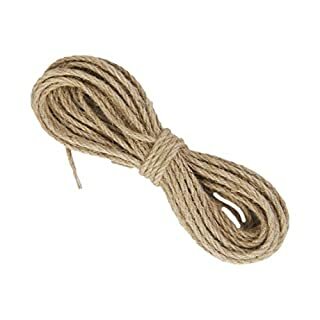 Take Your Crafting Game to the Next Level Houseables' jute twine is workable to any project you might have recently had up your sleeve and are wishing to undertake. 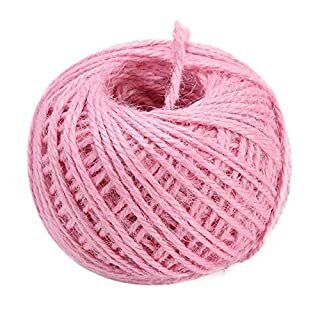 Whether you've decided to try your hand at crocheting, have a sudden desire to fashion hand-made bracelets, or are generally looking to spice up some of your household items with a slightly rustic touch, this twine is made for that artsy innovator. 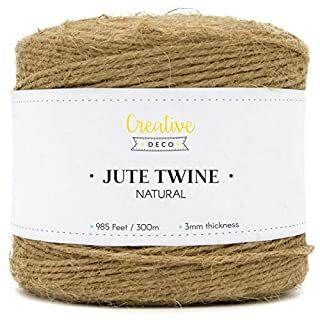 Gift-wrap to Your Heart's Content If you have a special occasion coming up and are in need of something to wow your friends and family, our jute twine can do just that. Houseables' twine gives you endless possibilities when it comes to showing off your newly acquired unique gift-wrapping skills. The avid crafter has the ability to tie endless ribbons on gift boxes and goodie bags for those people in their life that they hold dear. It's Party Time It's possible that you will never want to purchase party decorations again, once you get your hands on Houseables' jute twine. You can put together place settings, birthday banners, centerpieces and decorate invitations, to name just a few of the many ways to incorporate this twine in your party planning agenda. Workout Your Green Thumb Using twine can simplify your gardening experience and add a unique touch to the process. Wrap your herb bundles or create plant support for your sprouting buds. Suspend vegetables for curing or design hanging planters for your flower blossoms. And since our jute twine is bio-degradable, you'll be giving back to the planet in the midst of doing your thing in the nursery. 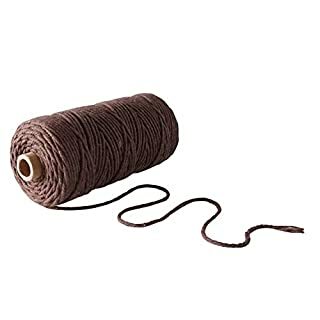 b>Description:Natural Hemp Cord is the preferred choice for use in crafts including jewelry making, scrapbooking, handmade cards, gardening and more Material: Jute Color: Brown Thickness: Approx. 3mm / 0.12 inch Length: Approx. 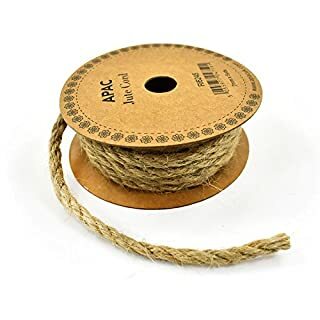 10m / 10.94 yardsb>Package Includes:1x 10M Jute Twine Ropeb>Note: Since the size above is measured by hand, the size of the actual item you received could be slightly different from the size above. Meanwhile, please be reminded that due to lighting effects, monitor's brightness / contrast settings etc, there could be some slight differences in the color tone of the pictures and the actual item. 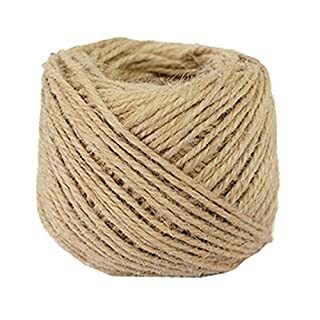 Very useful and durable natural jute twine. It will be a good helper in your life. Use occasion: 1 Use it as an art craft to wrap the winding decorative bottle to surround the glasses. 2. Use it as a ribbon on a gift and as an accent for some crafts. 3. Use it to show your very beautiful photos. 4. Use it to pack gifts, the best gift wrapping line, to make gifts more creative. 5. Use it as a winding garden to preserve tomatoes, cucumbers and other vegetables. 6. 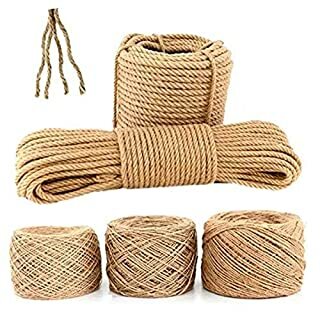 Gift DIY material, natural colour jute twine, handmade essential, DIY is a good helper. 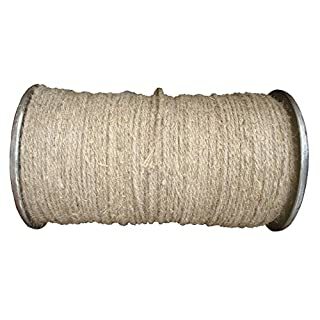 Garden Decking Rope - Historic Weather Resistant Synthetic HempThis soft to handle rope has the look and feel of a natural fibre rope, but as it is synthetic, does not shrink when it gets wet and is weather resistant. This synthetic hemp (also known as hempex) rope is therefore perfect for use in a variety of different outdoor or indoor settings, including on stairs, as a balustrade on decking, as fencing and on children?s play equipment such as swings. The golden brown natural colour of this highly durable synthetic rope allows it to blend in well with any decking, so it looks fantastic in your garden, as well as performing exceptionally well thanks to the grip and strength it offers. 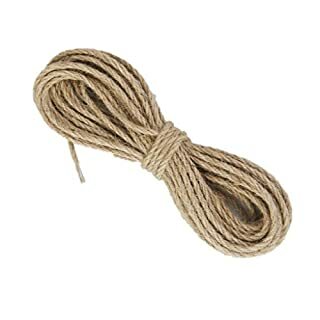 24mm Synthetic Hemp Rope is our most popular choice of rope for Gardens and Decking. Specifications - Diameter (mm) Breaking Load: 3mm 60kg. 4mm 120kg. 5mm 190kg. 6mm 320kg. 8mm 500kg. 10mm 800kg. 12mm 1100kg. 14mm 1500kg. 16mm 2000kg. 18mm 2400kg. 20mm 3000kg. 22mm 3650kg. 24mm 4800kg. 30mm 6400kg.